As I planned what to make for my parents for dinner back in May, when I was wedding venue scouting back home, I tried to apply my regular meal planning philosophy: peruse the cupboards, freezer, and fridge for big, perishable items that need to get used up, then plan around those ingredients. This approach helps me to avoid waste and spoilage, saves money, and makes room for new and exciting ingredients down the road! This time, my challenge was two big bags of Archer Farms frozen butternut squash, and a package of my favorite gluten-free brown rice penne from Trader Joe’s. I’ve officially designated it not only the cheapest, but also the best, gluten-free pasta around, once you master the cooking method. I searched my Pinterest boards for butternut squash, and Ashley’s healthy butternut squash mac and cheese stared me in the face! Knowing I probably couldn’t get Mom to eat Indian curry, the mac and cheese was an almost instant winner. Now, in some cases, I love a recipe sooooo much that I basically just rewrite it in my own words for the blog (giving proper credit, of course). 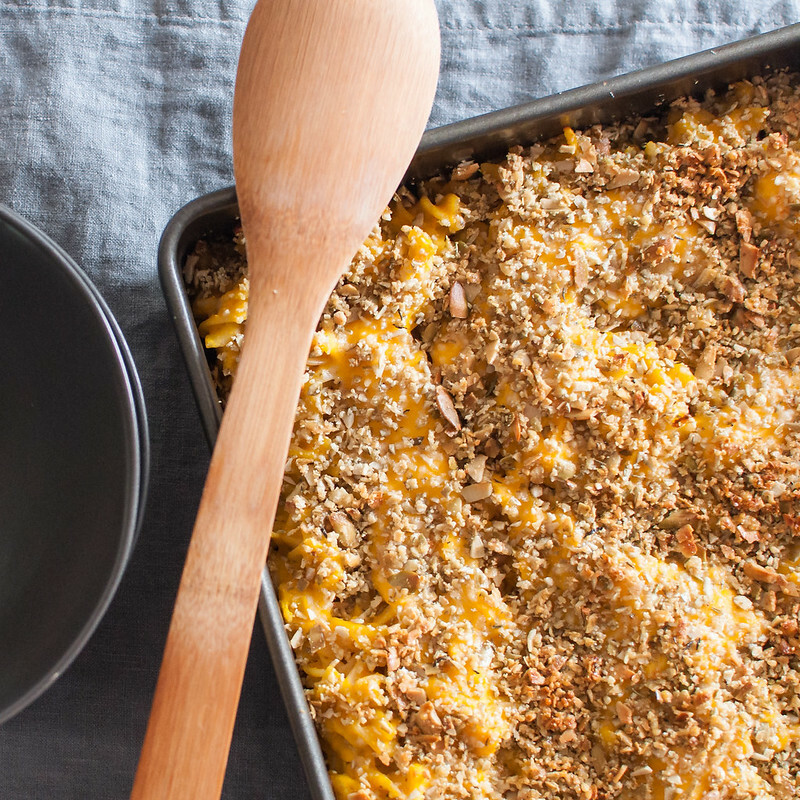 With this butternut squash mac and cheese, though, my recipe isn’t much like the one it’s based on. I changed up the ratio of sauce to noodles, streamlined the process of incorporating the squash (no roasting needed! ), stepped up the cheese factor, and, my favorite, invented a super crunchy, crumbly, gluten-free topping made not of breadcrumbs, but of raw pumpkin seeds and parmesan. My hunch on the topping was right: using raw (not toasted) pumpkin seeds allows you to put the topping on before the mac goes into the oven. 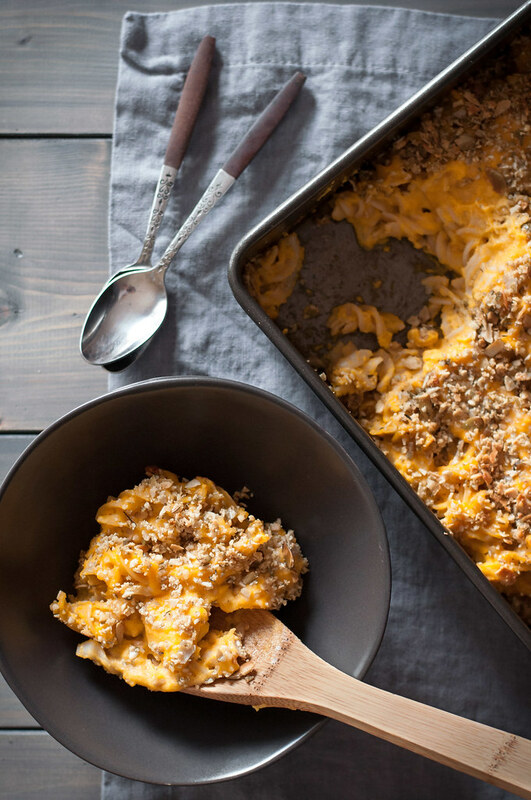 You don’t have to mess with taking the mac and cheese out halfway through cooking to add the topping, or covering and uncovering and covering (etc.). Why? 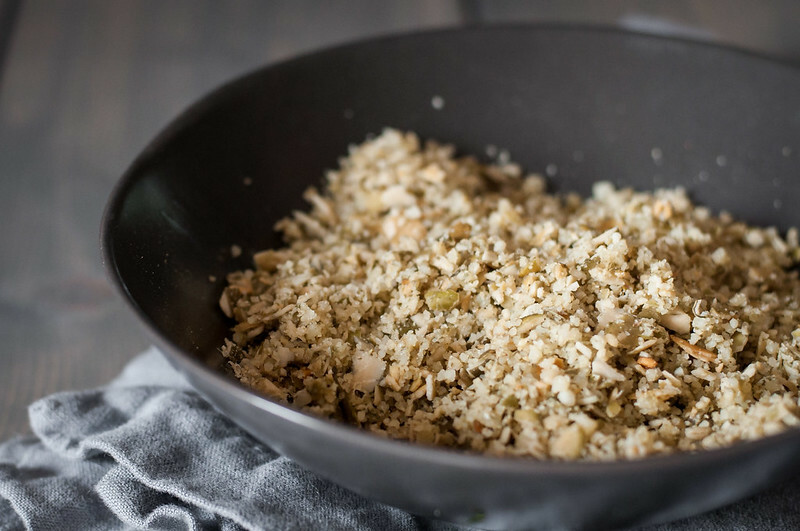 Because the raw pumpkin seed crumble toasts slowly while the mac bakes, leaving you with a crunchy, not burnt, topping to complement all that creamy noodle tenderness beneath it. 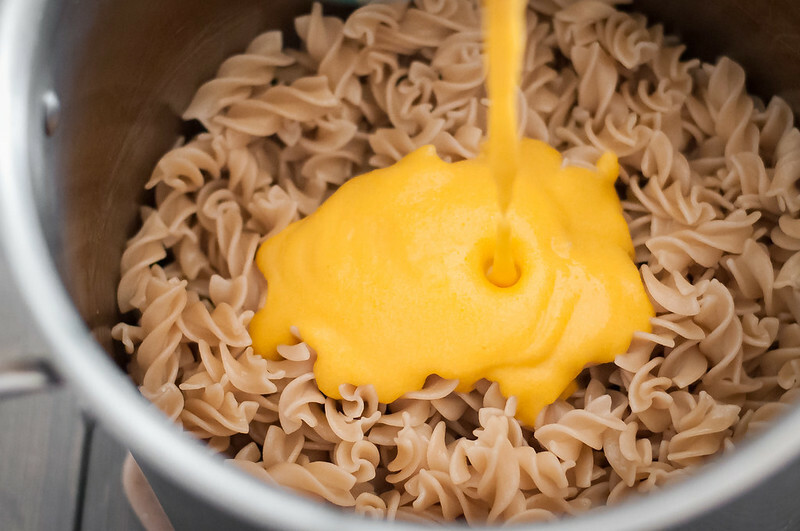 I cannot handle discussing mac and cheese in this much depth without rewarding myself with some, so after finishing this post I’m whipping up a pan of my 4-ingredient gluten-free mac and cheese for dinner with friends tonight. You can only eat so much butternut squash mac and cheese in one week, which is why I’m going for a different version tonight. The cheese is coming up to room temp now, and I’m going to add some peas for color and texture. Buttttt I think I might go with this pumpkin seed topping, especially since some unexplainable force possessed me to buy two pounds of raw pumpkin seeds last time I was at TJ’s. In case you haven’t picked up on it already, mac and cheese in my house is often a very Trader Joe’s-friendly dish. Here I am with a new recipe, telling you to go make a different one, but if you have very fussy eaters who will call you on the butternut squash, I’d definitely recommend my simple 4-ingredient mac. Like the sauce for this butternut version, there isn’t a roux that adds unnecessary flour and needs to be watched carefully. Whatever you choose, though, my ultimate recommendation is this: make some mac and cheese this weekend, or at the next opportunity. Basic or loaded with extras. Gluten-free or not. Classic cheese sauce or healthy butternut squash sauce. It might just make your weekend (or work week!) a little bit happier. 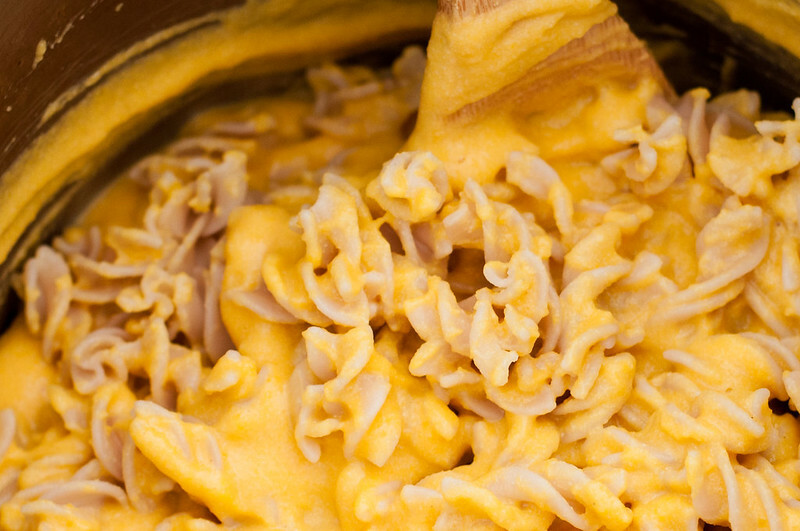 It still has cheese and milk, but healthy gluten-free butternut squash mac and cheese gets bright color from hidden veggies in an easy cheese sauce. Set a large pot of water over high heat and keep salt and pasta nearby. Set cream cheese and cheddar out to come closer to room temp. Heat oil over medium in medium saucepan, then add shallots and cook 3 to 5 minutes, stirring occasionally, until well browned. Keep heat low enough that shallot doesn't burn. Add garlic and sauté another minute, until fragrant. Add milk and squash and stir to mix--the squash won't be submerged in the milk. Raise heat to medium high and cover. Once boiling, reduce to low heat and keep covered. Stir occasionally, simmering 10 to 15 minutes, until squash is fork-tender. Remove from heat and blend slightly cooled mixture with immersion blender or a standard blender until very smooth. Combine squash puree in the saucepan with cheese, 1¼ teaspoon salt, and ¾ teaspoon white pepper, stirring until cheese melts. Add ½ tablespoon salt to boiling water, then add pasta and stir. Maintain a moderate boil. For Trader Joe's or Tinkyada brown rice penne or fusilli, cook 5½ minutes, check for doneness, then boil up to 6½ minutes until very firm but edible. Turn off heat, let pasta rest in water for 30 seconds, then drain in a colander without rinsing. Add cooked pasta to sauce and stir to combine well. 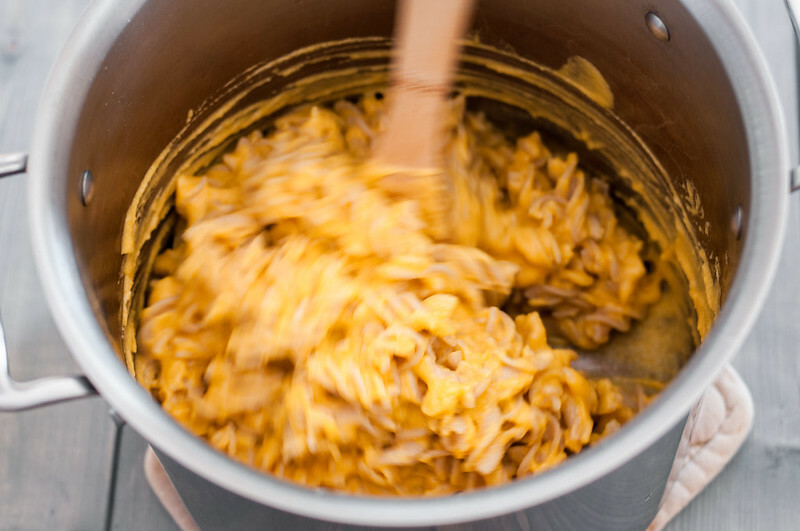 Spread mac and cheese in a lightly oiled 9 by 13 inch pan or baking dish. Pulse pumpkin seeds in food processor 20 to 25 times to form coarse crumbs. Combine crumbs with parmesan, thyme, salt and pepper to taste, and olive oil or melted butter, using your fingers to work fat into the crumble. Sprinkle topping over mac and cheese. 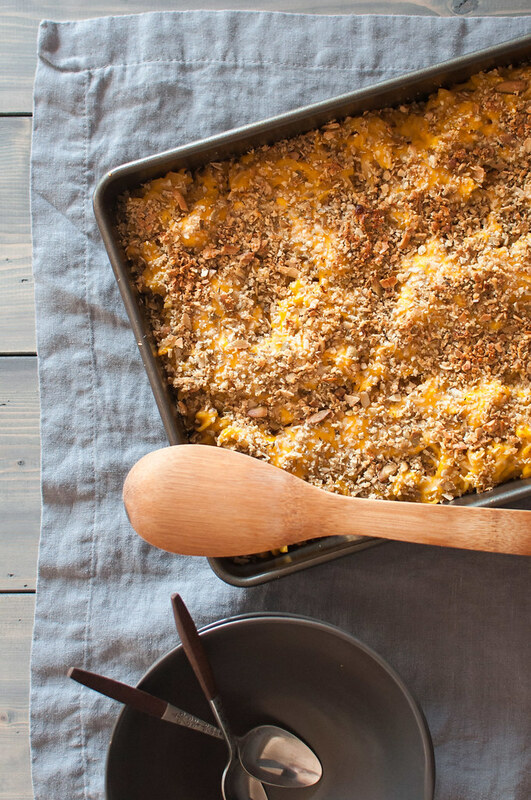 Bake 15 to 20 minutes, until mac and cheese is hot and crumb topping is lightly browned. If topping doesn't brown, broil for a minute or two. Cool slightly before serving. If you plan to serve the mac and cheese with salsa, pesto, or other condiments, or with veggies mixed in, try omitting thyme from the crumb topping for a more basic, adaptable flavor profile. Recipe adapted from Ashley McLaughlin of Edible Perspective, via Craftsy. Note: This page contains affiliate links. It does NOT contain sponsored content. 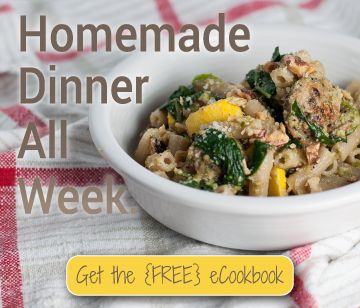 Affiliate links (to products I recommend, on Amazon) offset my ingredient and website maintenance costs, so I can keep bringing you noodley recipes like this one. Thanks! This looks delicious, and I’m gonna give it a shot, but I have a question. I’m planning on using fresh squash, as it’s in season. How much, by weight, would you say 6 cups equals?